The media used to say that Oprah Winfrey was America’s favorite girlfriend, overlooking the fact that no one is a better friend than a galpal whose life is constantly careening out of control, someone like Liz Lemon, who I will allow is not a real person. A recent 30 Rock episode had Tina Fey’s alter ego Liz Lemon feigning personal filth, homelessness and plague-carrying contagion in a bid for more personal space on New York’s crowded subways and streets. Check it out here. It turns out that Tina Fey knew what she was talking about. 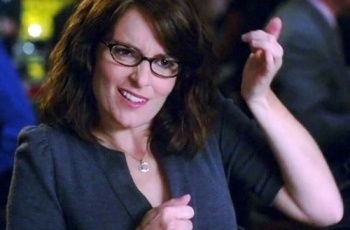 Like Liz Lemon, I am a closet Emily-Post-aholic. I like good manners. I don’t always have good manners, but I really like it when others do. The problem is that societal compliance on this point is not as broadly practised as it should be. Case in point: People who do not bathe seem to have no problems cozying up to those of us who do, usually in places from which we cannot escape, such as the grocery store line-up. They snuggle in, exuding the aroma of week-old nicotine, alcohol fermenting through their pores, and a body odor that I will not name (good manners prohibits it). Oprah, loved by millions, has not helped me at all with my crazies-crowding-at-cash-out problem. Ten minutes ago, this was exactly my personal experience at a nearby grocery store. A man dressed in clothes that could rightly be called a compost heap got in line next to me at the cash-out. I say “next” to me as opposed to “behind” me because he stood beside me, facing me, breathing down on me as though he were a personal delivery system for stale used oxygen loaded with carcinogenic molecules. My gag reflex was set to “vomit,” but there was nothing I could do but endure. It was that or abandon the line and as a serial shopper, I have never left my cash-out post. Ever. In the past, my normal methodology to regain my personal space and some breathable air would be taken from my high school basketball days, which is that I would pivot in place, thus smacking said offender with my packsack or perhaps a random elbow, but no one can prove the latter. If that did not do the trick, I would step back into the too-close-non-companion, sometimes even stepping on toes. This could be a form of assault, but who would convict me? The problem with today’s freakoid was that he was so repugnant on every level of sensibility that I could not risk grazing the guy – the disease-and-pestilence factor was too high to chance. Enter Liz Lemon. Desperate, gagging, I pulled a tissue out of my pocket and proceeded to empty my nasal passages into it. The problem is that I am not congested, so I really had to work at it to produce the correct repulsive qualities. From my peripheral vision, I spied the stinker take a step back. 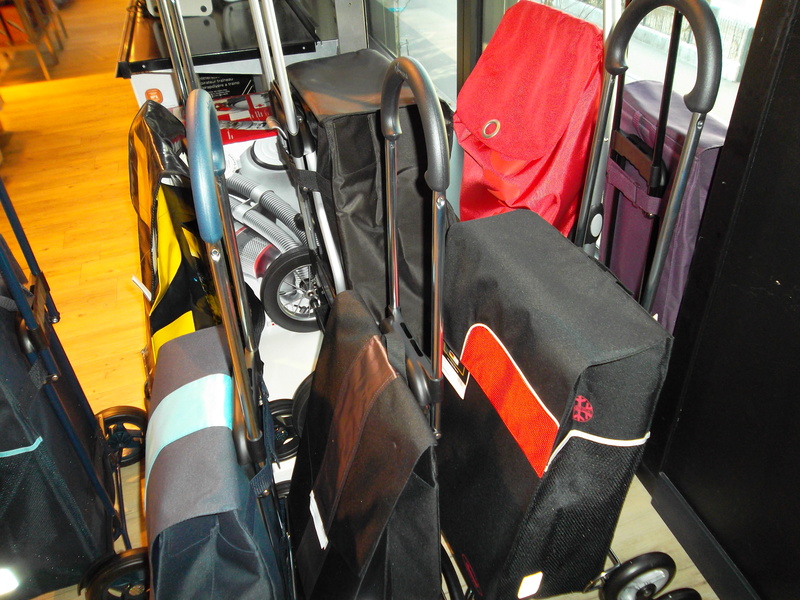 I laid my goods out on the grocery belt and then engaged in a coughing fit in his general direction. My performance drove the entire line-up back into the aisle,* even though I covered my mouth while coughing (some good manners are reflexive, I cannot cough without covering up or my mother might appear and smack me on the back of my head). This is Europe, the land where lining up at a cash till is a contact sport, and yet, as my coughing continued and my groceries moved down the conveyor belt, the stinker was so aghast that he did not place any of his groceries in behind mine. No one did. I had not only a berth of about four feet to myself, but so did my food. The cashier, instead of handing the receipt to me, tossed it in my direction, eying me for signs of smallpox. I felt like I had just won an Oscar for my performance. *This is true, except for a boy who looked to be about 7 years old, who began coughing with me. Visions of the plague revisited must have danced in the other shoppers’ heads. ** The stands-too-close stinker also wore dark aviator sunglasses inside the store. Does anyone else find that creepy? 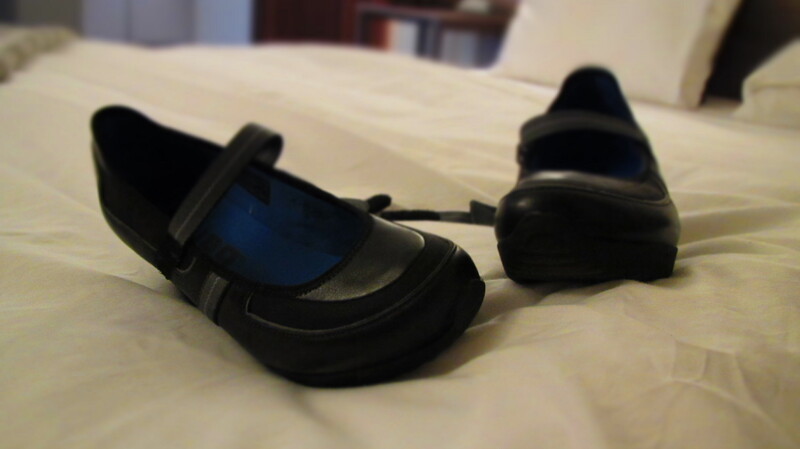 O beloved affordable shoes, where art thou? 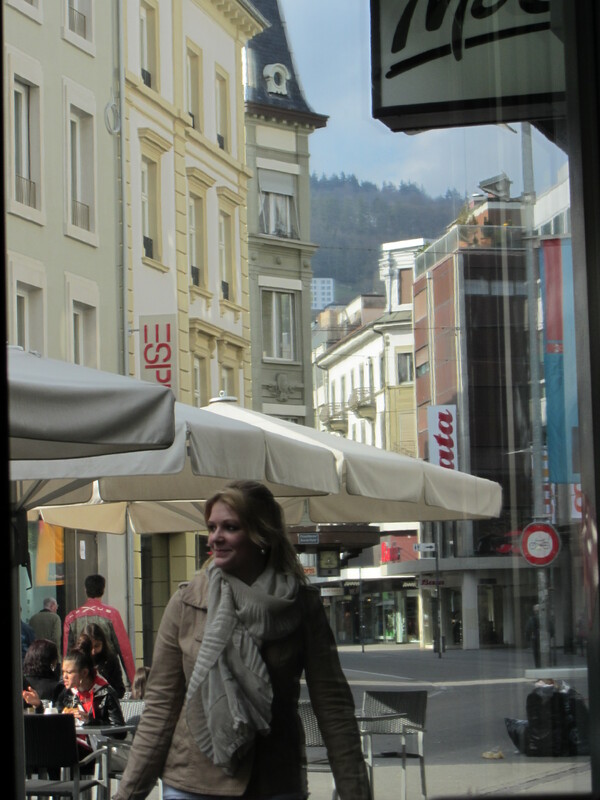 Shopping in Switzerland is not as much fun as one might think. For one thing, my favorite shoe brands here cost two to three times as much as they do in North America. A pair of Clarks loafers runs over $180, my treasured Merrell hikers are in the same range and higher. No problem, I thought. I’ll just order on-line. This has not worked out as happily as I had hoped. While I scored the lovely North American prices, shipping costs tipped near the $40 mark, plus a few extra dollars for the import fees. Ouch. But it was still cheaper than buying locally. That was until Switzerland’s diligent import bureaucracy caught up with me and plastered another import fee in the neighbourhood of 32 to 45 Swiss Francs on to my cute little purchases. I am not going to reveal how expensive this has become, because just saying it produces a scorching sensation in my skull. This has not actually helped the Swiss import bureacracy as much as they would like, because I will just stop buying shoes until I find a more fiscal-friendly store, and very likely that will only occur when I’m back in Canada. Nevertheless, I still love Switzerland. 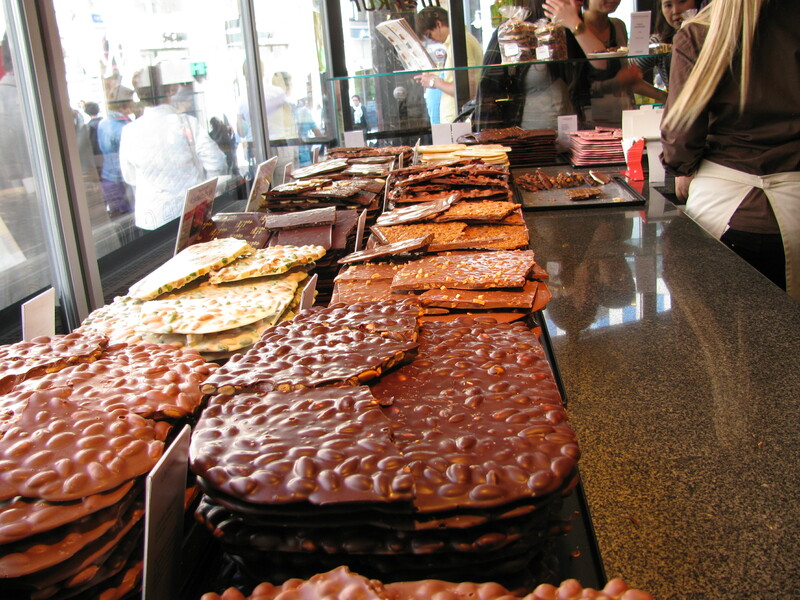 It has so many chocolateries, how could I not? 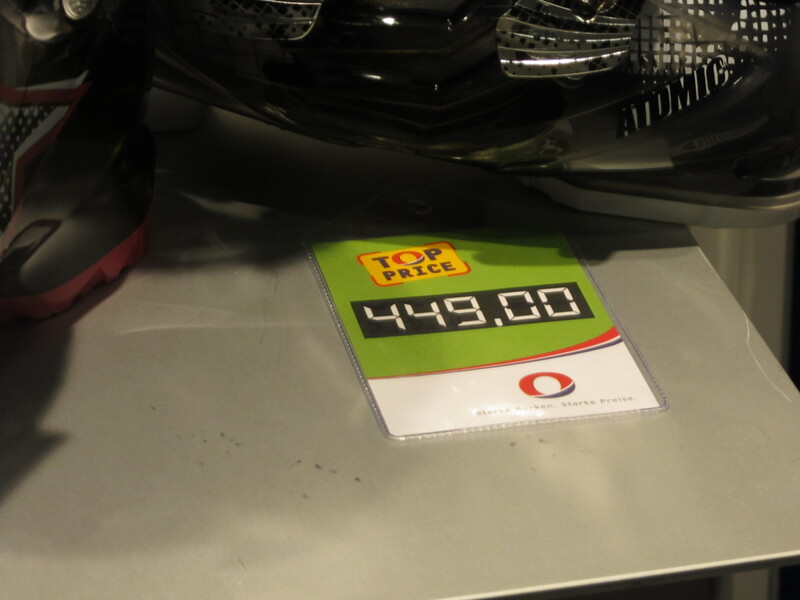 In other retail news: Here’s a photo of a typical “sale” price sticker in Swiss stores that reads “top price.” I’m sure they mean “best price,” but the first thing our North American brains read is that the store is charging the top/ highest price anywhere. Maybe that is what they mean. After all, this is Switzerland. Every day from 1960 to 1976, my mother warned me against talking to strangers, sometimes upping the warnings to four-times a day. She knew I wasn’t listening. Then between the years 2003 and 2010, on more than a few occasions I saw Times Colonist columnist Jack Knox exclaim, “Stranger danger!” before fading chameleon-like into the walls, making himself invisible to newsroom visitors. I suspect he was on my Mom’s payroll. Despite these admonitions, I keep talking to strangers, but now, I’m thinking of quitting. In a downtown grocery store, I was minding my own business when cold chalky fingers snaked around my forearm. It would appear there was no one there, but when I looked down I saw a withered white-haired woman with large brown eyes standing next to me. I want to point out: I was looking down. The number of times I have looked down to see another adult is embarrassingly low, and in fact, it only happened twice in North America. The other three times were here in Europe, where women smoke a lot, leading to stunted growth. The woman rattled off something in French, shaking her cane menacingly at me, then, with her hand still cuffed around my forearm, she led me to another aisle where she used her cane to point out items from the top three shelves that she wanted. It’s a rare experience to be the “tall” person in the crowd, so I didn’t protest. I retrieved the items, she released me, and I went on my way. Only, I was flummoxed. I left my grocery basket in the aisle where she had abducted me, along with my senses, forgetting what I was at the store for in the first place. I picked up some yoghurt, just to look like I was there on legitimate business and headed to the line-up where I found the old woman in front of me. Again, she took charge, demanding in French that I go in line in front of her with my paltry purchase, but I, in a bid for self-determination, steadfastly refused. She was somewhat crippled, frail-looking but obviously used to being in command. I’ll bet she had 15 children and they are all still terrified of her. A tall, lean couple shuffled into the line-up and I thought I heard them speak English. I turned to them, indicating the old woman and said, “She’s a feisty one,” so they would understand that I was a total stranger to her and not her mentally deficient grand-daughter. The couple glared at me, and I realized they did not speak English, but that might not have made a difference anyway. The woman, her long hair dull and scraggly, motioned toward one arm as though injecting a phantom syringe, let her tongue loll out, wagged her head back and forth with her eyes careening about in their sockets. It was the international sign for, “I am a heroin addict, I’m out of my mind, and I don’t know what you’re saying.” The man, tattoos covering his arms, grunted in agreement. Okay, Mom. You win. No more talking to strangers. At least, not for today.